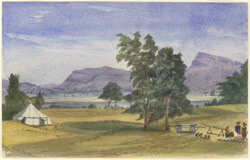 Water-colour painting of Chopan on the River Son (Uttar Pradesh) with the Kaimur hills in the background by Stanley Leighton (1837-1901), 19 December 1868. Inscribed on the mount in pencil is: 'Chowpun on the Soane-Kaimoor Range and Mungeser Peak, Mirzapore. Fri. 19 Dec. 1868'; on the front of the picture is: 'From Mr Pollock's camp on the Soane.' Pollock was the Collector of Mirzapur and Leighton accompanied him on a Christmas shoot. Uttar Pradesh in northern India is bordered by Bihar to the east, Madhya Pradesh to the south, Rajasthan, Delhi, Himachal Pradesh and Haryana to the west and Uttaranchal and Nepal in the north. The region has a rich variety of scenery encompassing open stretches of meadow, dense forests, snow-capped mountains and perennial rivers. The Son or Sone River flows from the Amarkantak highlands about 3500 feet above sea-level north-west through many ranges of hills until it strikes the Kaimur Range, which constitutes the southern wall of the Gangetic plain. The Sone is the main tributary of the Ganga River along with the Yamuna.